“Ceramics: Form and Function” opens in Reynolds Gallery Thursday, Nov. 6, with a reception from 4-6 p.m., and will be on display through Dec. 19. The exhibition brings together work in clay by 14 internationally-recognized artists from around the world, each with a unique mode of working in the medium. Many pieces on display will be for sale. Local artist James Haggerty is one of very few potters in the country to use the Persian Luster technique, which creates a shimmering metallic surface on his pottery. 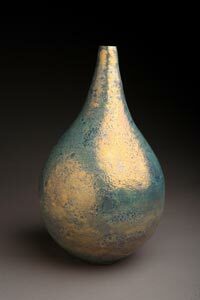 His pieces are delicately thrown and then glazed specifically to crater, fissure and bubble with an iridescent shine. Many pots are fired several times to achieve the desired results. Having dedicated his life to mastering the process, Haggerty is one of the best ceramic artists working in this style. Californian Marc Digeros, the model shop manager for architect Frank Gehry, says his ceramic work reflects architectural ideas of structure and texture. He folds and joins slabs of clay to create his pieces, letting the seams and layers interact with colorful glazes to create the final form. John Dix, an American-born ceramicist currently living and working in Japan, uses traditional Japanese materials and processes, including a wood burning kiln to create unpredictable finishes. His pieces often spend seven days in the kiln, producing finished glaze effects created from the path of the flame and the falling ash. More information about each artist is available at the Arts at Westmont page on the Westmont Web site, www.westmont.edu. Reynolds Gallery hours are Monday through Friday 10 a.m. to 4 p.m., and Saturday 11 a.m. to 5 p.m. For more information visit www.reynoldsgallery.org or call (805) 565-6162. ©2017 HAGGERTY CERAMICS. ALL RIGHTS RESERVED.